After easily taking the top spot last weekend with just over $35 million, Annabelle: Creation, another hit Conjuring spin-off for New Line Cinema, already earned more than twice its $15 million budget back in just its opening weekend. Standing in its way of a repeat are a pair of action-comedies arriving in wide release, Lionsgate's The Hitman's Bodyguard and Bleecker Street's Logan Lucky, which both feature all-star casts. 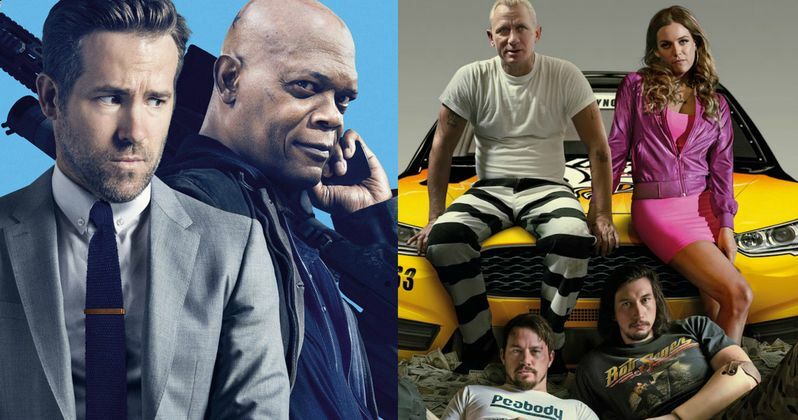 We're predicting that, since neither new release will have a particularly strong debut, it will be a very close weekend, with Logan Lucky just barely coming out on top with $20.4 million, followed by The Hitman's Bodyguard with $18.6 million and Annabelle: Creation with $18.2 million. There are a number of factors that lead us to believe it will be a low-grossing, tight weekend at the box office. For one, it doesn't seem that either Logan Lucky, which brings director Steven Soderbergh out of his self-imposed "retirement," or The Hitman's Bodyguard, the latest from Expendables 3 director Patrick Hughes, will be released in more theaters than Annabelle: Creation (3,502). Box Office Mojo reports that The Hitman's Bodyguard will be released in approximately 3,000 theaters, while no estimate was given for Logan Lucky quite yet. While Annabelle: Creation added to the notion that R-rated fare is making a big comeback, since it handily beat an animated sequel (The Nut Job 2: Nutty by Nature) and a critically-acclaimed drama (The Glass House) last weekend, we think this weekend, the edge goes to the PG-13 Logan Lucky over the R-rated Hitman's Bodyguard. For one, Logan Lucky, which stars Channing Tatum, Adam Driver and Daniel Craig, is already quite the critical darling, with an impressive 93% rating on Rotten Tomatoes, with just two negative reviews from 29 total reviews thus far. The Hitman's Bodyguard, which stars Ryan Reynolds and Samuel L. Jackson has not been nearly as well-received, with just a 46% rating, albeit from just 13 reviews (six Fresh and seven Rotten). Logan Lucky also has the benefit of catering to the NASCAR crowd, with the movie set at the iconic Charlotte Motor Speedway, and featuring a number of racers in the cast including Brad Keselowski, Carl Edwards, Kyle Busch, with Darrel Waltrip and Jeff Gordon playing themselves. Given the massive popularity of NASCAR, it's certainly possible that could help push Logan Lucky over the top in this tight weekend. Logan Lucky centers on brothers Jimmy (Channing Tatum) and Clyde Logan (Adam Driver) who, while trying to reverse a family curse, set out to execute an elaborate robbery during the legendary Coca-Cola 600 race at Charlotte Motor Speedway. The massive supporting cast also includes Katherine Waterston, Sebastian Stan, Riley Keough, Katie Holmes, Seth MacFarlane, Hilary Swank, David Denman, Jack Quaid, Brian Gleeson, Macon Blair and Dwight Yoakam. Steven Soderbergh returns to direct his first feature film since 2013's Side Effects, working from a script by Rebecca Blunt, a writer making her feature debut. However, there have been rumors that Rebecca Blunt isn't a real person, and may be a pseudonym for either Steven Soderbergh, or his wife, former E! News host Jules Asner, although the director himself has shot down those rumors. The Hitman's Bodyguard centers on the world's top protection agent (Ryan Reynolds), who is called upon to guard the life of his mortal enemy, one of the world's most notorious hitmen (Samuel L. Jackson). The relentless bodyguard and manipulative assassin have been on the opposite end of the bullet for years and are thrown together for a wildly outrageous 24 hours. During their raucous and hilarious adventure from England to the Hague, they encounter high-speed car chases, outlandish boat escapades and a merciless Eastern European dictator (Gary Oldman) who is out for blood. Salma Hayek joins the mayhem as Jackson's equally notorious wife. Rounding out the top 10 will likely be Dunkirk ($6.2 million), The Nut Job 2: Nutty by Nature ($4.6 million), The Dark Tower ($3.9 million), The Emoji Movie ($3.5 million), Girls Trip ($3.1 million), Spider-Man: Homecoming ($2.9 million) and The Glass Castle ($2.3 million). Also opening in limited release this weekend is Vertical Entertainment's action film 6 Days, Well Go USA's action-crime thriller The Adventurers, Samuel Goldwyn Films' drama Gook, Magnolia's comedy Lemon, Fox Searchlight's drama Patti Cake$ and Abramorama's documentary Sidemen: Long Road to Glory. It isn't clear if there are any plans for expansion for any of these new platform releases. Looking ahead to next weekend, three new movies will arrive in wide release, Sony's drama All Saints, Blumhouse Tilt's action movie Birth of the Dragon and The Weinstein Company's animated film Leap, with A24's Good Time also expanding nationwide. Also arriving in limited release is Neon's drama Beach Rats, FIP's action movie A Gentleman, Vertical Entertainment's horror-thriller Ghost House Well Go USA's foreign movies Legend of the Naga Pearls and The Villainess, Oscilloscope Pictures' drama Polina, Artsploitation's horror film Red Christmas, Entertainment Studios' documentary Served Like a Girl, The Weinstein Company's drama Tulip Fever and the 3D re-release of the 1991 action classic Terminator 2: Judgment Day. Take a look at our projections for the weekend of August 18, and check back Sunday for the official box office estimates.